A weekend package deal curated by Juan Dominguez and realised by BUDA (Kortrijk). Arts centre UDA (Kortrijk) has proposed Juan Dominguez to create a small platform that would bring together and place in perspective both his work as a choreographer and his talents as a curator in a context other than Madrid. Juan Dominguez accepted the invitation and decided to create an “all-in Winter Holiday Package Deal”. The programme of this exceptional trip is set up around Juan’s 2009 performance Blue, a major reference for (young) choreographers and dancers across Europe, which has however not been shown in Belgium yet. In the context of the development of contemporary dance, Blue opened a place in which the codes of representation are constantly manipulated, interfered with and invaded by reality; effectively blurring the boundaries between fiction and reality. Similarly, the artists Juan Dominguez invited for this weekend are operating within this ‘in-between’ environment. They are using and misusing the codes of (re)presentation, language and communi- cation, in order to open up new possible spaces in which other codes are operative. In addition, Juan Dominguez invited a number of eminent scientists to accompany us through this unique journey. Their lectures will tell us how the development of science, drugs and technology can lead to new perspectives of reality. 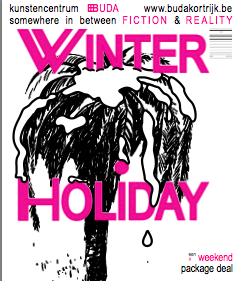 But perhaps the essence of this Winter Holiday Weekend Package deal was the creation of a space – fully in line with the crux of Juan Dominguez’ work – in which spectators can experience situations to- gether, instead of looking at representations. This ‘Deal’ is all about the sense of community, rather than the passive consumption of art.